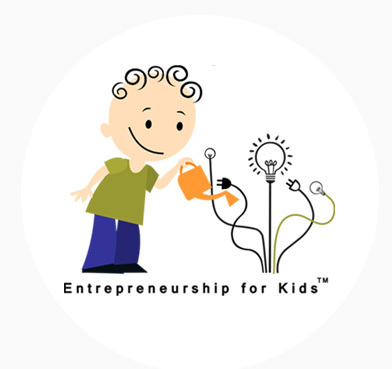 Entrepreneurship for Kids Program invites entrepreneurs as guest lecturers to schools to tell the students about their entrepreneurial story, and share the lessons they have learned from their experience. 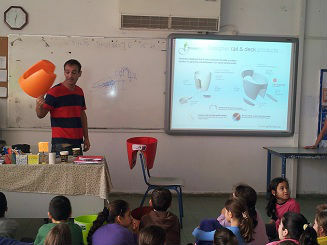 Lior came as a guest entrepreneur at the "North Star" school in the GEW2018 and explained to students that he an entrepreneur doesn't have to invent something new., The same was the case with the "Havtutim" project. The project was born from desire to grow many plants on the roof of his house. Lior and his son searched for information on the Internet, how to do it, combined some of the ideas they found and finally chose the solution of barrels. After uploading a post to Facebook, people became enthusiastic and became interested. At first, Lior built a barrel on a volunteer basis at a center for people with disabilities. He gave them a free workshop to see if there was any interest. He put his card on the barrel, and people who came to the center saw the barrel with strawberries and were enthusiastic, contacted him and ordered barrels from him. So the hobby has become a profitable business. There are people who order ready-made barrels, and there are those who take part in workshops he leads, together they make a barrel. Lior explained that at first not everything was perfect, but over time his barrels improved, mainly because he listened to the customers. Lior explained to the students: "It's very easy to fall in love with your product, but it's always important to listen to the customers... There were a lot of people who told me that the barrel was too big, I listened to them and then I made mini- barrels. And I added an automatic irrigation system, so people helped me improve the product. Lior summed up his insights: it's important to do what you love, because that's how you get the motivation to get up in the morning, it's important to listen to customers, and if the product needs to be modified in order to please them, it's recommended to do so. It's important to understand that there are many difficulties along the way, but you shouldn't give up. With will, faith, and determination you can overcome anything. Amit Saban, a boy who has experienced online humiliation by teenagers at his age, has decided to make children understand what it means to harm someone via digital means over the net, how to avoid it, and what to do when it happens to you. Amit founded the "Youth for Youth" organization, where he recruited boys and girls who lecture and explain about the social networking dangers, acceptance and tolerance to the others and how to preserve each one's dignity in the digital world as well. Amit is a guest entrepreneur who comes to schools during the year and in the Global Entrepreneurship Week. 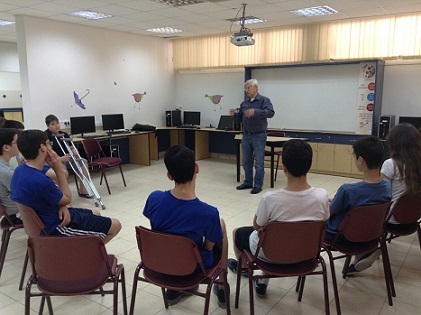 He recently attended the Ariel Sharon School on the National Week for Safe Browsing and shared his insights with the young students. We were first exposed to Tzuriel King during the 2017 Global Entrepreneurship Week, when he spoke at an inspiring lecture at the "Ilanot" School in Ashkelon. 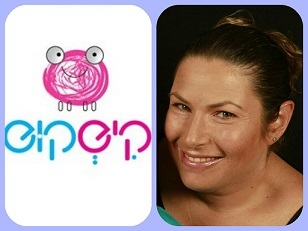 When the teacher Lee Shifman, who instructs the sixth graders at the "Katznelson" School in Kfar Sirkin, asked for a recommendation for a guest entrepreneur, we immediately got her in touch with Tzuriel. Tzuriel ended up coming to the school and sharing the story of the 1,200 kilometer long bike tour held by him, during which he collected donations for 150 struggling families, raising awareness of the importance of mutual help. The collected donations were used to purchase food packages, which were sent to people in need before the Passover holiday. Tzuriel started his journey after asking himself the same question as appears in the Hebrew song: "When was the last time you have done something for someone else?". The students showed interest in the lecture, asking questions and expressing their appreciation of the initiative. You can read about Tzuriel King's journey at this link. Tzuriel enjoyed the lecture as well and thanked Galit Zamler for the connection with the school. We met Doron after he agreed to be a guest lecturer during Global Entrepreneurship Week 2013. Following our meeting, Doron was also invited to the Sadot-Karkur school in Pardes Hana Karkur for their Knowledge Day and told the students about his project, 'Shop Good', which aims to encourage people and organizations to buy items produced by handicapped people, allowing them to earn a respectable living. Carmi is a Mamram alumnus. He has worked as a systems programmer at the innovative SANGate, BMC, and as an architecture manager at Discount Bank. 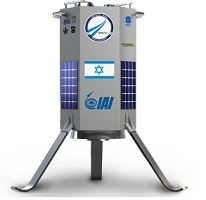 In 2004 he established Info meta Ltd. which founded several projects in Israel and around the world, including g-patrol, Seeds of Love, happy sale, happy hour, etc. Today, Carmi is CEO of a Startup in the regulatory field and advises other startups. 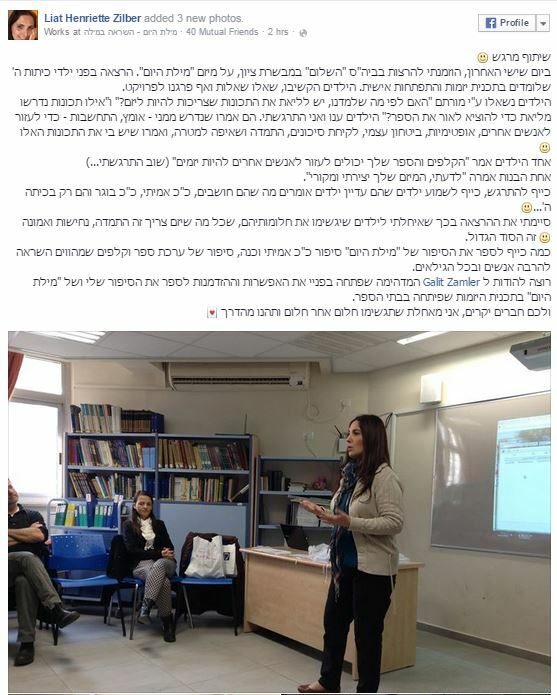 Carmi was a guest lecturer at the HaBiluim and HaManhil schools in Ramat Gan. During his lecture to students in the entrepreneurship program, Carmi spoke about entrepreneurship and innovation, and about the different aspects of a new project: the idea, the business model, the investment, the team, marketing and sales. He did so with many examples. At HaBiluim he put special emphasis on the students' project, School Vintage Store. Miri was invited to lecture at the Sadot-Karkur school in Pardes Hana Karkur during their Knowledge Day which took place on 31.1.2015. Miri told the children how she founded Kishkush, a company that organizes birthday parties, workshops, and activities for children at Brits and children's clubs, and organizes events. Miri spoke about the details that make her company's events successful, details that she learned through experience. For example: KishKush ensures that even if there are competitions during the event, there is no winning team, since it is important that everyone feels good and enjoys the event. We learned that parents look for birthday cake ideas, so today we also provide special cakes for events. We also discovered that it is important for parents that the birthday boy or girl are the center of attention, that they feel important, so we ensure that it is so, and emphasize that to the parents who are interested in hiring us for their birthday parties. In addition, at our events, everyone gets a prize, and the same prize, so that all the children will feel equally good. Miri spoke about events and activities that KishKush holds at hotels and large organizations, and how this helps her with marketing the company to more organizations. In this way, for example, she invites interested potential clients to come and see these events at large and well-known companies, which creates a good impression. Miri explained that it is very important to constantly re-invent yourself, and always innovate to remain relevant in the market. 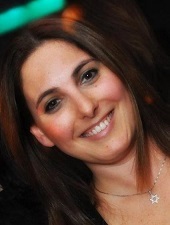 Liat was forced to finish her work as a dance and movement teacher and reflexologist due to her arthritis. During her lecture to the students, she spoke about how she found the strength to cheer herself up and in doing so, cheer others on. Liat published the book Word of the Day, a word that inspires and encourages action, and turns a person's day positive. Liat funded the book's production through crowdsourcing, and she spoke about this as well. She spoke about how the fundraising happened, what the project's supporters received, the moment of publishing and the excitement that came with it, and her plans for the future. -Were you able to raise the money? How long did it take? -How do you get the money? -How do you charge people? -How much should each person give? -Who did you consult with before putting the project on the website? -Do you feel better now, health-wise? Did you get better? 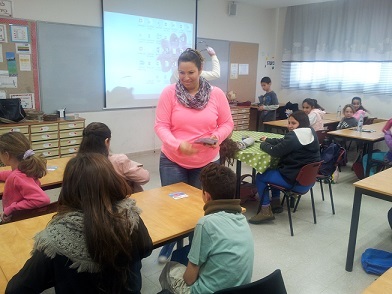 Liat's lectures took place at Mordei HaGeta'ot in Ramat Gan during Global Entrepreneurship Week 2014, and during the school year at Katznelson in Kfar Sirkin and HaShalom in Mevaseret Zion. Dear Liat gave a lecture for the students at the Katznelson school in Kfar Sirkin and made her mark, proving that even difficulties in life can lead to magical worlds if you have the will, determination and love. Thank you, Liat, for an unforgettable lecture! 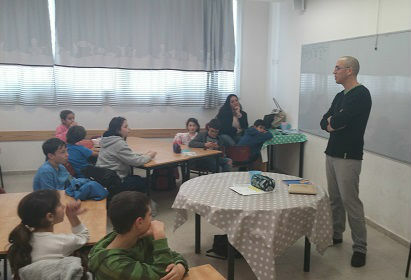 A photo of Liat's lecture at the HaShalom school for students in the Amirim program, which participates in the Entrepreneurship for Kids Program. 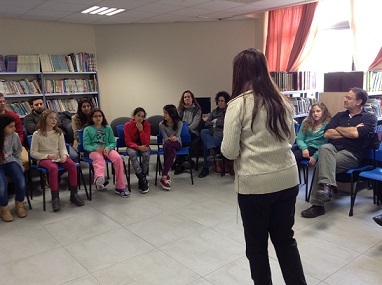 During a lecture at HaShalom, Sigal Bar, coordinator of the program, asked the students, what characteristics do you think she needed to have in order to publish the book? The students answered: bravery, mindfulness in order to help others, optimism, self-confidence, risk-taking, determination and striving towards a goal. Liat shared her future plans with the students: translating the book into English and selling it on Amazon. To conclude, Liat wished the entrepreneurial students' success following their dreams, even if it didn't all work out, and that they should never give up working towards their dreams. Determination, perseverance, and belief are all an entrepreneur needs. 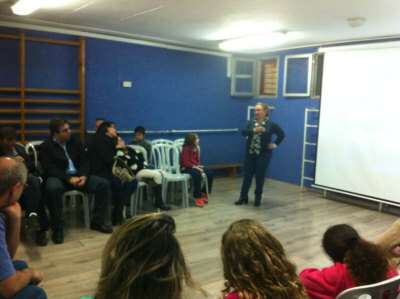 Liat also arrived at the Yitzhak Navon school in Shoham. This time, her lecture was to the teaching staff. The aim of the meeting was to expose the teachers, as part of the education for entrepreneurship in the school, for example from the process that an entrepreneur goes through, knowing that each entrepreneur undergoes a different process. Hanan Shemesh studied to be a lawyer, and in the past, he was the owner and CEO of a private export company for fresh agricultural produce. Later, he opened a law firm dealing with various entrepreneurial projects in the marketing and real estate field. He later focused on founding a global marketing network and in 2009 he joined a fulfillment fund as partner and works as a lawyer and chairman of the fund. A fulfillment fund locates promising business and entrepreneurial opportunities and provides investors options to make large profits from entrepreneurial activity. At the same time, Hanan is also a partner at Cofix, and these days, he is also a partner at the new Cofix supermarket, a chain where every item will be sold for 5 NIS. 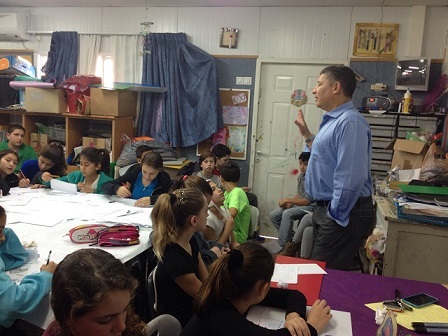 Hanan was invited to be a guest lecturer at the Katznelson school in Kfar Sirkin, and shared his experience with the students. Hanan spoke about the difficulties he had along the way, and how he dealt with them. For example, five days before Cofix was launched, their coffee provider got cold feet and left, because other companies, fearing competition, tempted him, or because he feared that the project would fail. This difficulty forced Hanan and his partners to find a new coffee provider within 5 days, and they did indeed find one. Hanan spoke to the children about the characteristics of an entrepreneur and about the ability to make dreams come true if you just want it and strive for it, and don't give up. Hanan also spoke about a social project that he is a part of: it is a project in which children from the suburbs participate in a preparatory program for the army, in order to encourage them to enlist and achieve significant positions in the army. In regards to the pleasant lecture this morning... the children are charming and it is obvious that you work well with them, given their quick understanding and approach to the subject. Good work! Lee Shifman wrote the children were fascinated and excited to meet a successful entrepreneur. 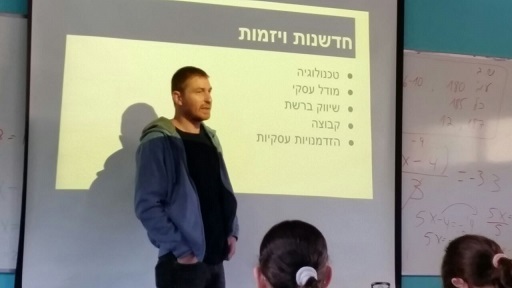 Hagai Cohen, an entrepreneur who develops games for disabled children, came to lecture to leadership and entrepreneurship students at the Mordei HaGeta'ot school in Ramat Gan. Hagai, who specializes in applied Physics principles, asked the children: How do you inflate a tennis ball, and why is the ball wrapped in a furry casing? After the entrepreneurship students attempted to answer the question. Hagai explained the different uses of variations in air pressure, like inflating tennis balls, or easily cracking nuts without crushing them. In addition, Hagai used the tools he brought with him to demonstrate how to easily lift a heavy object with things found at home. As an entrepreneur, Hagai shared an important tip with the students: an entrepreneur should be able to tell a direct, clear and interesting story, in order to make the target audience interested in his product/service. He spoke about how he successfully interested Larry Page, one of Google's founders, in his son's project about Voice over lp during a short conversation, after which the two held a business meeting. The students were very interested in the lecture, and at the end of the meeting, they wanted to know if Hagai would return for more lectures. 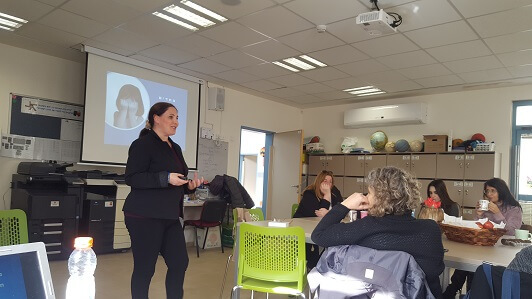 Sibel Zuaretz told the leadership and entrepreneurship students at Mordei HaGeta'ot school about the process of starting her business, Yoga Flowers, which she founded following a personal need to find a solution for her pain. During her lecture, Sibel spoke about choosing a name, designing the logo and its colors, how she began creating stories to remember the exercises in order during her workshops and lessons. Sibel also showed the students what activities she undertakes to market her business, like creating a Facebook page called creative yoga for children - yoga flowers, setting up a website called Yogali, writing a column in Being Parents magazine, collaboration with colleagues, and more. To watch a clip from Sibel's lecture, visit the Global Entrepreneurship 2013 page. 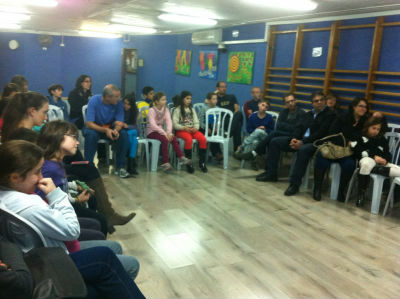 Around 50 students and their parents from the HaShalom school in Mevaseret Zion, which takes part in the Entrepreneurship for Kids Program, heard about SpaceIL - the spaceship project from Irma Ben Moshe. 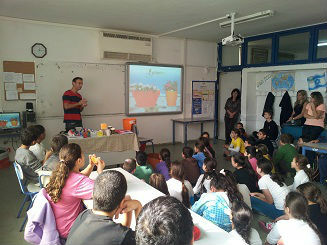 Irma presented a slideshow and told the students how they had the idea to land the first Israeli spaceship on the moon. The founders decided to take this opportunity to encourage the young generation in Israel to get involved in science and astronomy, and they did so through volunteers who visit schools and tell the students about their idea and the process they are going through. 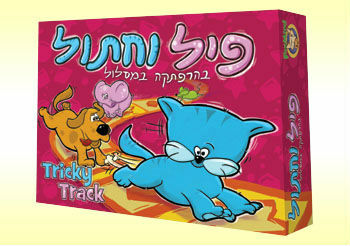 Ayala developed an unusual path game for children, Elephant and Cat in a path adventure. Ayala collaborated with Foxmind and the game became a success. During her lecture she spoke about the process she underwent until the project succeeded, and the different versions of the game from the idea stage until the final product. Ayala is also a social entrepreneur and during her lecture, she compared social and business entrepreneurship. 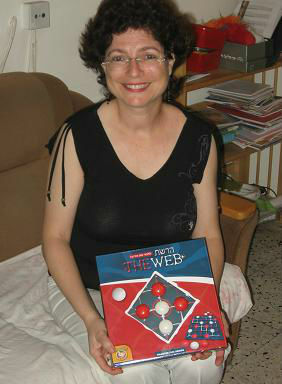 Ayala is married with two children, is a computer engineer, and works in high-tech. Among her hobbies are: reading, leading workshops for the elderly (about positive thinking, feeling useful and mutual aid relationships), and developing board games. In December 2010, Foxmind published another of Ayala's games. Ayala says that since she was experienced and well known in the games field, they helped her develop her idea into the game the Web. The Entrepreneurship for Kids Program recommends the fun game, which develops planning and strategic skills. EVT is lead by two entrepreneurs. 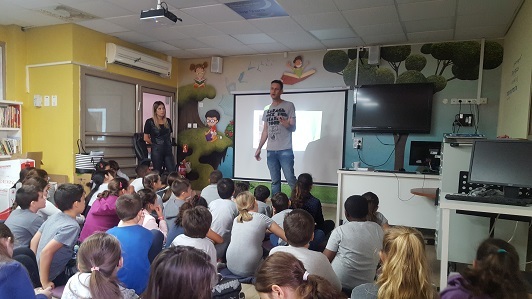 The founder of the project visited the Mordei HaGeta'ot school to lecture as part of the Entrepreneurship for Kids Program. 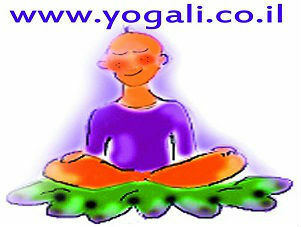 The project deals with health and fitness, and allows people to participate in fitness exercises at home online. The students saw up-close how to analyze a project's chance of success, what risks entrepreneurs take, and how they manage them. They also learned about the difficulties involved in a project, the need to manage your funds wisely, the need to fundraise in order to fund a project, and more. Finally, the students took part in a fitness exercise. Of course, they enjoyed it very much. 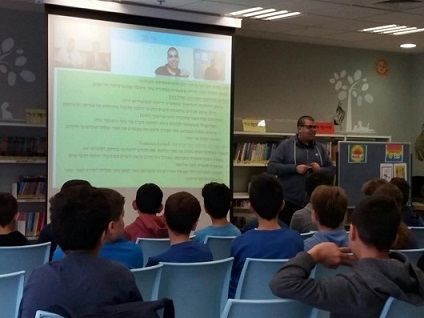 The EVT founders also visited the Blich school in Ramat Gan during their Owl Day and presented their project to 8th graders, sharing the process they go through as entrepreneurs. The Entrepreneurship for Kids Program understood that the EVT lecture is especially appropriate for students since it combines the lecture with physical activity, which the children enjoy. Therefore the EVT founders were invited to more lectures at schools, especially during Global Entrepreneurship Week. Hi, I'm Yossi Balely, 22 from Holon. My family includes 6 people. I am the oldest son of four. From the end of 2008, I've dedicated most of my time to creating children's games. Creative thinking is not an easy thing; it requires a great effort. Luckily my 11-year-old brother Kobi, who is the youngest, helps me with this. He helped me with the first game I developed and marketed, Supergoal the Card Game. Everyday I sit and think about which game could interest children and encourage them to buy it, because there are many games out there, so why should Israeli children want my game in particular? Anyway, the important things are: willpower, determination, optimism, creativity, and never give up! A short explanation of the game: Supergoal the Card Game is a group game for ages 6 and up, a thinking game for anyone, not just for soccer fans. 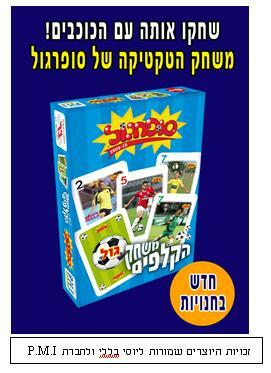 It is a soccer-themed card game with 4 teams from the Israeli League. In the game you find soccer rules, and with these, the smartest player will win the game. 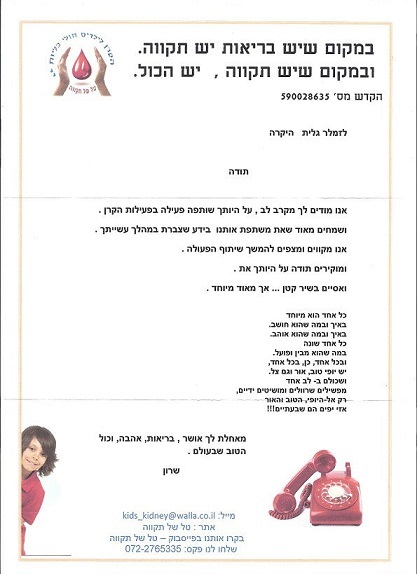 Tal Shel Tikvah is a foundation that aims to help children with kidney disease and cheer them up. The foundation works with 6 hospitals in Israel. Israel has four dialysis wards for children who undergo dialysis daily for 6 hours. During the dialysis, the children can't walk around, and must stay in one place. Sharon said that the idea for their social project came from her own experience. From 10 months until age 12, she lived in the hospital- she celebrated birthdays and even her Bat Mitzvah there. She remembered the boredom she felt as a child spending so much time in the hospital, and even then decided that when she grew up, she'd help those children. What do the kidneys do in the body? Why do the children need to undergo dialysis? Isn't it better to do it while they're sleeping? What happens to hyperactive children, who can't stay in one place for so long? Don't they get used to the boredom? Sassi and Sharon answered the questions and said that undergoing dialysis at night, while the kids sleep, is a good idea, but the cost of a dialysis machine is very high, and very few families can afford to buy one. 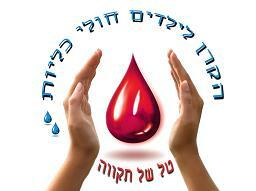 The Tal Shel Tikvah Foundation was founded to cheer the children up during their dialysis. Among other tasks, the foundation took it upon itself to organize fun days for the children outside of the hospital, and to give them some variation in their daily life. The foundation sends a monthly kit with art supplies in order to help with the children's boredom. The foundation also produces original movies and sends the children well-known animated movies that they can watch to make their time in the hospital more pleasant. The lessons Sharon and Sassi learned while starting a business: Many times, those around you will oppose you and won't support your project and idea, so it is important to know the significance of making your idea a reality, to believe in yourself, in your path and in your truth, and to insist. These will help you be creative enough to overcome difficulties. The children considered the problems involved in starting a foundation and in its activities, and suggested their own solutions to problems like fundraising, volunteering, candy and games. They also suggested solutions to logistic problems like transporting donated items in order to package them and deliver them to hospitals around the country. Sharon spoke about how before Hannuka she posted a Facebook ad asking companies, organizations and other donors to donate, and within 10 minutes, she got calls from 5 clowns who have published CDs, each of whom donated around 100 discs. Other companies donated gift baskets, and many people volunteered to assist with packaging. In order to fundraise further, Sharon recorded herself telling her life story, and an author wrote the book, My Body Won't Betray Me. All of the book's profits go towards the Tal Shel Tikvah foundation and towards helping children with kidney disease. At the end of the lecture, the participants of the program took part in the social project and helped to package gifts for the sick children. You are invited to visit the foundation's website, Tal Shel Tikvah and see their activities, volunteer, and donate. We would like to mention that PMI responded to the Entrepreneurship for Kids Program's telephone request and donated 100 packages of Supergoal cards, which were added to the gift packages. The founders of Tal Shel Tikvah answer all of the Entrepreneurship for Kids Program's invitations and often come to lecture at schools. They did so during Entrepreneurship Day at the Kaplan school in Petah Tikvah, where many entrepreneurs from the Entrepreneurship for Kids Program took part. They also came to the Mordei HaGeta'ot school as guest lecturers, and to Yad Mordechai in Bat Yam during Global Entrepreneurship Week 2012. Gilad is co-CEO and founder of an online information project called Audio Didact: Turning knowledge into information. 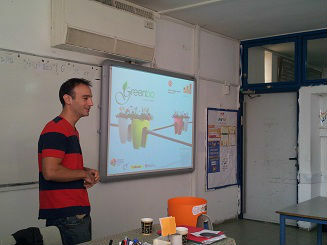 Gilad visited the Kaplan school in Petah Tikvah during Global Entrepreneurship Week 2011 as part of their entrepreneurship event, and the Mordei HaGeta'ot school in Ramat Gan during Global Entrepreneurship Week 2012. 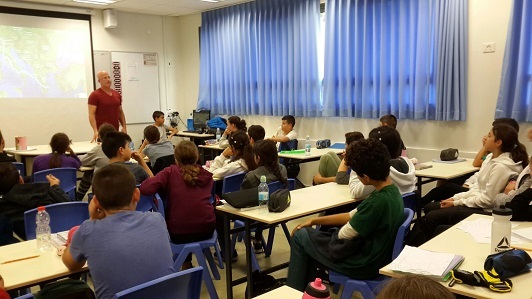 The Yad Mordechai school in Bat Yam, which promotes entrepreneurial and innovative thought, turned to Roy Julus and invited him to the school as a guest lecturer for 4th graders participating in the Entrepreneurship for Kids Program. Roy was thrilled at the invitation and agreed to come and speak about the company he founded with his partners, the uniqueness of the colorful flower pots they developed, and protecting the invention with a patent. Beyond the exciting colors of the flowerpots, the pots are unique in that they can be placed on any railing, of any thickness or shape. Roy showed the children some slides and explained the flower pots, answered questions, spoke about the need which sparked the project, and of course, brought some flower pots to show the children. Eyal told his personal story, which led him and his partner to move to Manhattan, found a business for American ricochets attached to mountain bikes, which offer rides in Manhattan, and from there, he arrived at a big opportunity involving bikes. This opportunity took him and his business partner on a wonderful path of experience and adventure. But at the end of the day, the idea did not become a reality, so in fact, he failed. In his lecture, Eyal passed lessons and empowering beliefs to the students regarding success and failure, and gave the children a basic and simple recipe for making dreams come true. For example: Failure is part of success. Success comes from the ability to keep going again and again, despite failures along the way, until you find success. Like a toddler taking his first steps, he stumbles and falls until he succeeds. Today, Eyal works as a deputy manager at a pet store in Holon, where he expanded activity and business, together with the owner, through a process of business consulting which he offered the business, using his academic background and his experience as an entrepreneur. At the same time, Eyal is working on his new project, which focuses on "different" and creative education for kids aged 8-25. The goal is to provide them with the practical knowledge and tools necessary to make their dreams come true and create success and fulfillment in their lives. "I decided to turn to you, dear children, before you become adults, because your way of thinking is a lot more open from that of adults, and therefore you have a very high ability to learn. You are very creative, and above all, your memory, principles and beliefs are pure and you are ready to accept new and different ideas. Within you, I see curiosity, magic, love and the joy of life, and this inspires me greatly." Eyal believes that the children of the world are the future, and he is, therefore, determined to reach as many children around the world as he can so he can do his part in creating a better world.